Kijk op Boeken This book is an attempt to make sense of what is the matter with humanity today. For the author and artist Kareline van der Burg 9-11 was a turning point and the inspiration of her artistic work. It made her think about Americas karma, the loss of the Indian Wisdom and the outright aggressiveness of America. Kareline realised that the western way of living is no longer the way forward. That inspired her to start studying the Indian culture and their love and feel for the unspoiled nature around them, seemingly unparalleled in history. Indians viewed their interaction with the animals and plants as important lessons to help them understand their own nature. 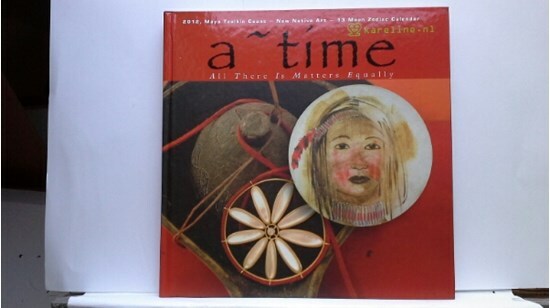 As a result of Karelines inspiration, poetry and artwork, a rich illustrated art book was born: A Time: All There is Matters Equally . A masterpiece with glossy pictures of painted drums and jewellery and a new calendar, which makes you think about our cosmic nature. A collection of new native art, like goat-skinned drums with oils, with feathers and shells. The 52 drums are accompanied by 365 sentences to announce a new mindset to honor Gaia. The book shows jewellery inspired by the Mayan Calendar, revealing the relationship between cosmic cycles and our body. A perfect gift for who loves art and the true spirit of nature.